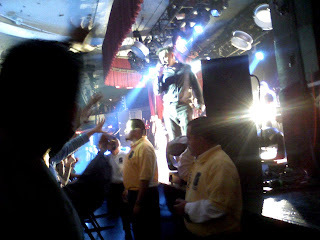 Last night I went to see Morrissey at the Hollywood Palladium. I stood front row but very much off to the side, which means, I got a great view without the discomforts of the massive crowd pushing behind. I had times to freak out, times to sing along, and also moments where I just leaned against the railing and stared at Morrissey in pure bliss. It was actually my first time seeing him. Once in a blue moon, I feel like this is one of the happiest days of my life. My first two fashion shows, I felt that way. My first time at LA fashion week, I felt that way. Last night, I felt that way. Not many people really know me, but I've always felt that I am very much like Mister Morrissey. I've always felt a connection in my soul.